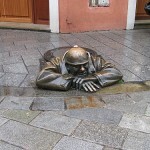 In an attempt to create some life in the city center of Bratislava after the fall of communism the locals made some statues to be placed around in the center of Bratislava. These statues have since then turned extremely popular and everyone coming to Bratislava grabs hold of their camera as they see them. Most famous is the statue called Cumil. He dates back to 1997 and is a funny guy looking up from a street manhole. Cumil is lucky to have his head still, as several drivers have crashed with him. That is why he has his own traffic sign now saying “Man at Work”. At the Main Square of Bratislava you can find another statue called “Napoleon’s army soldier”. 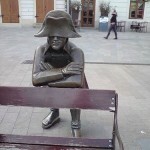 This statue shows visitors what kind of hat Napoleon used during his visit to Bratislava in 1805. 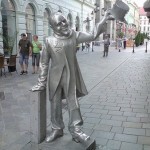 There are two other statues as well: Beautiful Ignaz (Schone Naci), a polite gentleman always greeting people on the streets of Bratislava and “Paparazzi” making pictures of everyone entering into the famous Paparazzi restaurant.